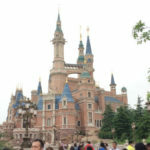 « Shanghai Disney Resort, Part 3: Snack Time! I’m glad to say that any fears that a mainland Disneyland would feel like a pale shadow of the original are entirely unfounded. Shanghai Disneyland has adapted to local norms, as it ought to. Every Disneyland has to adapt to the local culture, you can’t just transplant a major cultural artefact and force it completely unchanged onto the locals. That’d just be colonialism silly. My Duffy bear had a whale of a time too! A word of caution before we start: make sure your tickets are from official channels! And they do check IDs on entry. On peak days, Disneyland may not sell tickets on-site, so it’s best to buy online beforehand. 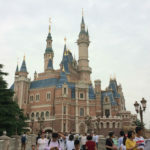 So let’s set the scene: We planned our larger Shanghai trip around 2 days at Shanghai Disneyland, so we avoided the weekend and public holidays. I visited in June 2018 on a Wednesday (hot and sticky) and Thursday (rainy all day long). Unluckily for us, that Friday was children’s day in China and many families took advantage of the school holiday. D’oh. This is a long post, so you can skip down to my strategy, a breakdown of each area (Mickey Avenue, Gardens of Imagination, Tomorrowland, Toy Story Land, Fantasyland, Treasure Cove, and Adventure Isle), some shopping and food highlights, and my final thoughts. And if you haven’t already, check out my previous post for Part 1: Toy Story Hotel and Disneytown. 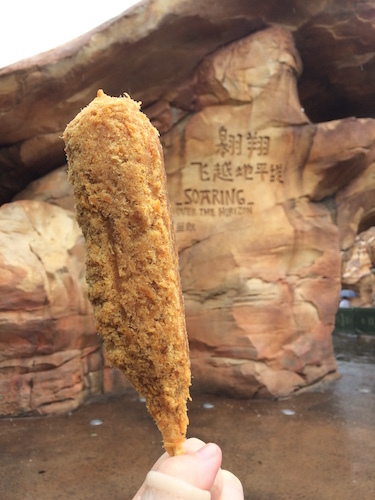 Part 3 is now up, spotlighting some Shanghai Disneyland’s interesting snacks! My park strategy centres around FastPass 快速通行证, the nifty system that lets you skip queues for selected rides. To briefly recap: FastPass gives you a time slot where you can enter a special, shorter line. FastPass is free but there are limited quantities each day. You will need the official Shanghai Disneyland app (available for Android and iOS at time of writing), and not just because the park heavily emphasises using it for everything. While it’s incredibly useful, it does require a mobile data connection. Given the Internet restrictions, it’s safest to download it before you leave for China. Personally, I dislike this increasing emphasis on using the app across the various Disney parks, since not everyone may have a mobile data connection, but you have very little choice if you want to use FastPass. Cast members refused to give us paper FastPass and forced us to use the app. I also noticed that instead of each ride having a set of FastPass machines, the machines are huddled together in the respective area’s central information kiosk. 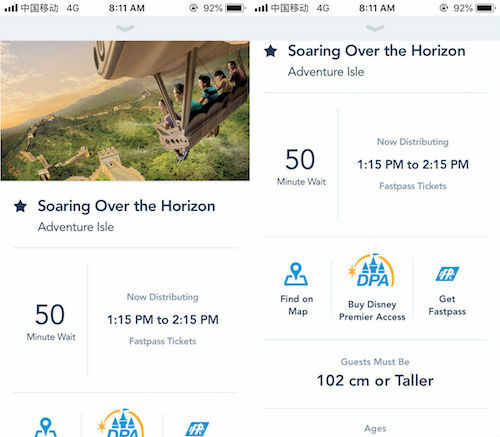 If you’re not a hotel guest: immediately use the app to get a FastPass for Soaring Over the Horizon. …queue for Pirates of the Carribbean while waiting for your Soaring timeslot. After that, get a FastPass for Roaring Rapids or Seven Dwarves Mine Train, depending on your preference. If you’re vigilant about checking ride times and depending on the crowd, it might be possible to ride Peter Pan’s Flight, Many Adventures of Winnie the Pooh, and Buzz Lightyear Planet Rescue while waiting for your timeslot. You don’t necessarily need a FastPass for Tron Lightcycle Power Run due to its short ride time and high capacity, especially if you ride it at night when the crowds start to thin out. In general, waiting time was around 30-40mins for most rides with the exception of super-popular Soaring, Roaring Rapids, and Seven Dwarves Mine Train. Waiting times for these three rides never fell below 60mins while I was there. Soaring is insanely popular; expect FastPass to run out within 30mins after opening. If it rains, expect everything to double to around 60-90mins; if you’re unwilling to wait, Disney Premier Access may be your only viable option. Shanghai is the only Disneyland where you can buy a FastPass. This is called Disney Premier Access (DPA) and it’s available for selected rides. I’ve read several posts where visitors bought DPA in one of the stores, but I wasn’t able to – the app was my only option. DPA was 120 CNY (S$25) for 1 ride, or 600 CNY (S$126) for 7 rides at the time of my visit in June 2018. It’s probably more expensive now because Disneyland has since added more eligible rides, which you can find here. I didn’t need to buy DPA, but I had two full days and I prioritised certain rides over others (and ultimately chose not to go for every DPA ride). If you only have one day, are visiting during a peak period, or if you absolutely must ride everything, then seriously consider DPA. Do note that you can only buy DPA through the app after your ticket has been scanned for entry. And don’t fall for the touts who try to sell you FastPass within the park! DPA was introduced in part to beat them, and cast members do match your face to a photo taken at the entrance whenever you use your FastPass. Right then, let’s go area by area! Remember that you can click here to jump down to any section: Mickey Avenue, Gardens of Imagination, Tomorrowland, Toy Story Land, Fantasyland, Treasure Cove, and Adventure Isle, and some closing thoughts to round everything off. Mickey Avenue is the equivalent of Main Street USA, though it’s much shorter than I’d expected. It’s home to the Avenue M Arcade, which is supposed to be the main store, but is oddly small. I feel that the World of Disney store outside in Disneytown has better pickings unless you’re looking specifically for park-branded merch that says “Shanghai Disney Resort”. From the main entrance, one of the first stores you’ll see is Carefree Corner on the right. This is where you can get your PhotoPass 乐拍通. PhotoPass works differently from other Disneylands; here, you need to make payment before you can even get the PhotoPass. We paid 199 CNY (S$24) for 1 day of digital photos. 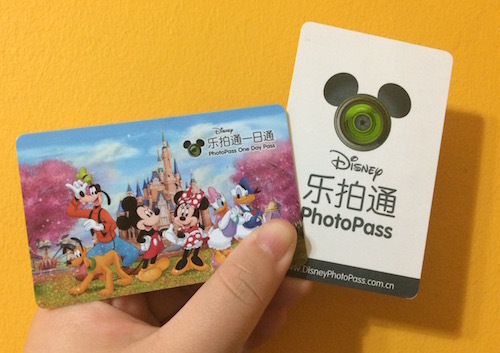 You can buy PhotoPass in-app if you download the PhotoPass app (separate from the Shanghai Disneyland app). We tried a couple of times, but weren’t successful – maybe because we were using an overseas credit card? Anywho, the PhotoPass card is actually a pack of two cards. Don’t lose either! The plain card is the one you will hand to the photographers; the fancier card contains a code that you need to link to your PhotoPass account so that you can download the images later. The neat thing about PhotoPass is that it includes photos taken on the rides, so it’s pretty handy! Do note you’ll need to sign up for an account on the PhotoPass website because it’s separate from your Disney website account. Photos were valid for 60 days for download, but you can get physical prints too. Carefree Corner is linked to Sweethearts Confectionery, which is one of two Duffy & Shellie-May stores in Shanghai Disneyland. You’re in luck if you like Gelatoni the cat and Stella Lou the rabbit. I guess the Shanghai folks like Shellie-May much more than Duffy, as the merch leans heavily towards Shellie-May rather than Duffy. The other Duffy store is called Whistle Stop Shop, further down the row and closer to the castle. At the end of Mickey Avenue, you’ll come to the Gardens of Imagination area. This hub area is unique to Shanghai, and largely makes up for the shorter Mickey Avenue. There’s the Fantasia Carousel and Dumbo the Flying Elephant rides, but I’d give these a miss since there’s so much better stuff to ride. This is also where you’ll want to camp out for the evening fireworks; unfortunately, I only got to enjoy the lightshow because it was too windy for fireworks while I was there. There’s lots of lovely photo areas and places to rest, but the only real attraction here is the Marvel Universe hangar. It’s pretty basic, and mostly I went in to enjoy the air conditioning. The inside is mostly photo ops with Captain America and Spiderman, a pretty neat Stark Expo display of Iron Man suits, some videogame-like play sections, and a small shop. From here, we’ll explore the park clockwise, starting from Tomorrowland, Toy Story Land, Fantasyland, Treasure Cove, and Adventure Isle. If you’re a hotel guest who’s taken advantage of your early entry through the Disneytown entrance, you will emerge near Tomorrowland. For me, this is the standout area of the entire park. Where other Tomorrowlands has always been very charming and retro, like what the 1960s thought the future would be like, Shanghai’s Tomorrowland actually feels like our modern-day idea of future. It reminds me of Xandar, really. Instead of Space Mountain, Tomorrowland is dominated by the sweeping, graceful curves of the Tron Lightcycle Power Run. Based on Tron: Legacy, it’s the one of the absolute best rides I’ve ever been on and it rightly deserves all the praise it’s gotten. Brief but intense, it clocks in at around 2 minutes but it goes super fast! You sit bicycle-style as you race against another Tron lightcycle in an indoor ride, with parts of the track outside. This is one ride you should definitely ride at night, since it’ll look pretty spectacular. Accessible seats are also available. I was put in the accessible seat because I was in an arm splint and didn’t have much grip strength, but it was still super fun. I had to take my glasses off for safety reasons, so I couldn’t see much (which really added to the terror/exhilaration). Couple that with an excellent Daft Punk soundtrack, you have the recipe for one of my favoritest rides ever. Here’s a tip: there are lockers right outside the ride area, but you don’t need to rent them. You can bring your bags into the ride: large bags can be temporarily stored with cast members, and small bags can be stowed on the ride with you. If you must rent a locker, bear in mind they’re only available for a full day rental at 60 CNY (S$13). The lockers do accept cash, although the poor UI of the payment screen suggests otherwise. The Tron Realm area is adjacent to the Lightcycle entrance. It’s a great waiting area for the rest of your party as it’s an air-conditioned mini arcade where you can learn about cars and build your own virtual lightcycle. Also let’s be real, it looks really cool. If you descend down a long ramp to the lower level of Tomorrowland, Buzz Lightyear Planet Rescue is very similar to the ride that you can experience in other Disneylands. I like it cos it’s always fun to shoot light guns and help Buzz defeat the Evil Emperor Zurg! Unfortunately, the Star Wars Launch Bay area was closed both days I was there, so I didn’t get a chance to check it out. Based on the exterior, it’s a hangar similar to the Marvel area. Tucked away between Tomorrowland and Fantasyland is Toy Story Land, the newest area that opened in April 2018, just a month before my visit. It’s easy to miss the smallest themed area of the park, which only has three rides. Rex’s Racer is a straightforward viking-style ride, and I remain curious why Slinky Dog Spin and Woody’s Roundup rides are so similar to each other. They have the same basic principle: you spin around and around at speed. I suppose that Slinky Dog Spin is the more grownup version with more thrills. The latter is best for small children and has an infectious soundtrack which’ll get stuck in your head for the rest of the afternoon. Here’s a tip: the junction between Toy Story Land and Fantasyland is a great place to catch the afternoon parade. It’s near the start of the parade route, but just a little out of the way so the crowds don’t really know about it. The afternoon parade is a rain or shine event, though the rainy version is a greatly reduced version (from 10-12 very impressive floats to 2). Enchanted Storybook Castle is biggest, tallest, most impressive castle that dominates the skyline of the park. For once, you can actually believe it was a medieval-ish castle! Use this as your guiding landmark. The lack of landmarks is my only real gripe here; I got completely turned around, and since the low buildings are so spread out and signage is a little sparse, I had no idea where I was. Fortunately, I figured out that you can use the architecture as shorthand to figure out which side of the park you’re on. If you can see the stage, Mickey Ave is behind you. If you can see the bridge linking two towers, you’re on the Adventure Isle-Treasure Cove side of the park. If you can’t see either, you’re on the left side of the park where Tomorrowland is. The bottom of the castle houses a stage. Because we visited in a bit of a lull period, they had retired the spring performance and hadn’t yet started the summer one. You can walk around the upper levels of the Castle through the Once Upon A Time Adventure. (Enter from the outside – exit towards Fantasyland, then turn around and look for the small hanging signs) It’s a simple retelling of the Snow White movie in some diorama sets and projections. But I mostly wanted to see the interior in detail. 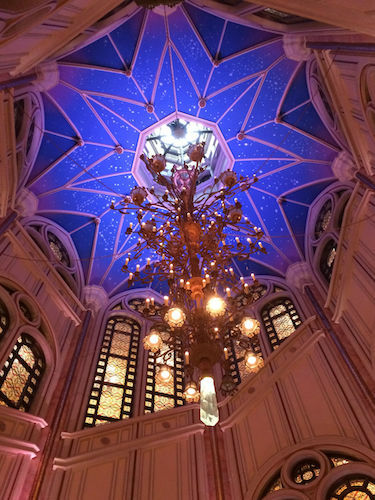 The castle is also home to the Royal Banquet Hall, the only posh restaurant in the park. Here, you can meet Disney characters during your meal; it’s eye-wateringly expensive, but you do get what you pay for. Reservations are recommended. Exiting from the back of the Castle will take you into Fantasyland, the quintessential Disney land! It’s worth noting that Fantasyland is oddly-shaped (perhaps for future expansions?) so it’s easy to miss whole sections. It’s worth to take your time to explore and pop into the many shops and eateries if you need a break from the heat/cold. I wish I had more time to linger at Fantasyland or ride more of the rides, but I guess I’ll have to save that for my next trip. Seven Dwarves Mine Train is located here, and it’s really popular. The shortest wait time I saw was 45mins, but that was only briefly; most of the time, it was 75-90mins (going up to 120mins when it rained). It’s easily the 2nd most popular ride in the park. The Many Adventures of Winnie the Pooh and Peter Pan’s Flight are FastPass rides, and both suitable for small children. As you make your way across Fantasyland to the right-hand side of the park, I recommend stopping by the outdoor pretzel and churros cart on your way to Treasure Cove because the pretzel is excellent. Your first stop should be the Pirates of the Caribbean. It’s a very close contender to Tron Lightcycle as my favorite ride in Shanghai Disneyland. Instead of just a boat ride through some neato pirate scenes, this take on Pirates involves traditional animatronics before morphing into a giant IMAX screen and A PIRATE BATTLE WITH actual! giant! ships! around you!!! I was blown away (heh) and I would’ve ridden it again and again if I could. Expect waits of 30-45mins, or more if it rains. This ride is super cool, but definitely one that you can fully appreciate if you’ve ever been on another Pirates cos then you get how much more over-the-top this is. It’s just so much more advanced and impressive. The rest of Treasure Cove is probably the largest area and a showcase of just how immersive theming can be. It’s very atmospheric and nice to chill, and great for kids to burn off some energy. The area is dominated by a large lagoon, where you can hop onto a Explorer Canoe to paddle around the water. As you stroll down the streets, you’ll pass a large ship docked on your right – that’s Siren’s Revenge, one of the two outdoor exploration spots. Just a little further down is where Treasure Cove nearly seamlessly into its neighbour, Adventure Isle. The transition is so subtle that it can be difficult to tell when you’ve passed it, but a good rule of thumb is that once you’re past Captain Jack’s Stunt Spectacular, you’re just about in Adventure Isle. The most popular ride in the entire park is Soaring Over The Horizon, which is tucked away in a little grotto-like area framed by some tall rocks. Depsite this, it’s nearly impossible to miss if you just follow the crowd. The FastPass for this is nuts! It runs out within 30mins of the park opening. Expect to be waiting up to 90-120mins if you can’t get the FastPass. To be honest, I’m not entirely sure why it’s so popular; you fly over a few areas in an nifty IMAX rig, but that’s about it. The IMAX effect isn’t even that impressive – the first time I rode it, all the tall buildings appeared crooked because I was in the very last seat. Next door is the Roaring Rapids, a water ride. The queue time never went below 60mins for this so I never had a chance, and even the line for single riders was never below 45mins. Other than that, there’s Camp Discovery, which is a rope obstacle course if you’re feeling really energetic; if you’re not, go and enjoy the Tarzan: Call of the Jungle show, which is 30mins filled with exciting acrobatics. As you trundle along towards the Castle, it’s worth taking a slight detour to see the Wandering Moon restaurant’s lovely traditional Chinese architecture. Facing the castle, taking a left will bring you back towards Mickey Avenue and rounds off our tour of the Disney lands. Almost all the restaurants are cafeteria-style, where you order from one of several stalls and pay before eating. Most of the choices are various Chinese specialties ranging from 70-90 CNY (S$15-19, includes a drink), with the most expensive western food options topping out at around 130 CNY (S$28) for steaks and such. There’s no halal food, but there are vegetarian options like magherita pizzas. Hot water is freely available at eateries and there are water coolers throughout the park. Do note that even though glass thermos are commonly used in China, they’re not allowed inside for safety reasons. What kind of sorcery is this?? If you’re looking for souvenirs, Shanghai’s merch is pretty interesting. In my opinion, Tokyo still has the best quality merchandise, but Shanghai has unique offerings too: a stamp rally, interchangeable Mickey hairbands, pressed pennies and their excellent selection of pins. 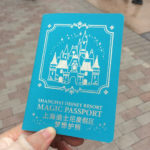 A pretty nifty souvenir is the Magic Passport which you can get at the stores. It’s half activity book, half stamp rally where you collect stamps throughout the park. 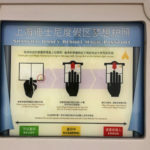 Insert your Magic Passport into special machines to get stamp unique to that area. If the machine is down, head to the nearest store and they’ll stamp it for you. You’ll get a surprise gift once you complete the stamp rally too. Another cool item is the interchangeable Minnie Mouse hairbands, which I adore. It’s a Minnie hairband with the original polka dot bow, except the bow is a clip! You can swap out your bow for one of several princess-themed ones on sale. The base hairband is 120 CNY (S$25), the same price as other non-customisable headbands, so you can be fancy without breaking the bank too much. They’re a little heavy, so it may take some practice balancing, but they’re awfully pretty. The pressed pennies range is pretty decent; each coin is 10 CNY (S$2.10). Machines are mostly four designs each, though there are a few with sets of 8 where you can get a small discount for the whole set (70 CNY instead of 80 CNY). There’s even one machine with the 12 Chinese zodiac! If you’re a Disney pin trading enthusiast, you’re most definitely in luck. Shanghai Disneyland probably has the best pins across all the Disney parks – and yes, this includes the US ones! We’re talking fancy holographic pins, pins with hinges and other moving bits costing around 50 CNY (S$11) and with such a wide range of designs, many of them unique to Shanghai. Only the special editions were in the 70-90 CNY (S$15-19) range. How awesome are holographic pins? You can find the main range in Avenue M Arcade and Carefree Corner in Mickey Avenue, but stores in each themed area will have their own selection. You can also try to trade with cast members, but my Chinese was nowhere good enough, so I just got mine off the rack. I love the pins there! 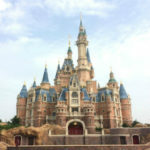 I love Shanghai Disneyland. Yes, it has some flaws – I don’t get why Soaring is so popular, and wayfinding could be improved – but it’s got that Disney magic. Much as it pains me to admit,it blows Hong Kong out of the water. If they keep up the maintanence over the next couple of years, I could see it as a real contender to Tokyo as a crown jewel of Asia’s Disney parks. 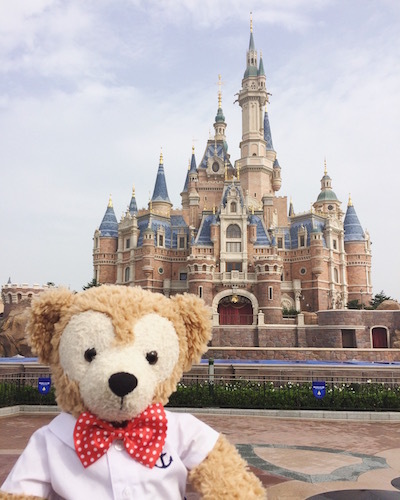 Shanghai Disneyland is a park best appreciated if you’ve been to another Disneyland first. Although I love Hong Kong dearly, if you don’t need “Disneyland lite”, I’d recommend Tokyo as first stop because the rides more closely match Shanghai’s. This will set you up to truly appreciate how Shanghai has fully taken advantage of improved ride technology. I’ve had bad experiences with local tourists on previous trips, so I was a little apprehensive. But I noticed that the Shanghainese are quite well-behaved and were as frustrated at the pushers and shovers as I was. The more unruly folks were domestic tourists who are likely from the less urban areas. Either way, there was almost no queue cutting; the cast members were generally superb at being polite-yet-firm. Is pollution an issue? Unfortunately, yes. Prepare for scratchy throats with sweets and lots of water, which is thankfully clean and free throughout the park. That being said, Shanghai’s snacks are pretty cool. I ate a couple of great things while I was there, and I can’t wait to share them with you in Part 3!